Like any kitchen appliance, garbage disposals can get really dirty. Sometimes, it’s so dirty that malfunctioning seems to be the only logical outcome. But it is expected. I mean if we shove food, soft and hard, down a machine everyday, of course it’s gonna get clogged up, not to mention the buildup odor. So what are we gonna do now? We clean our garbage disposals. Those solutions, though effective to a certain extent, can be damaging to parts of the machine. Using them once or twice won’t cause any problems, but relying too much on them to do the dirty work will most likely turn ugly. Because, unlike what they’re advertised to be, these chemical substances can be corrosive. It doesn’t mean that we should shun cleaning solutions out completely. They have their use, and God knows sometimes we do need them. What I actually want to stress here is that there are steps we can take to clean up our mess besides exploiting chemicals. And this little article is gonna be all about that. When the time comes, there are two possibilities. First, it has just started to smell bad and just that. This is the easy situation. A simple homemade “remedy” of vinegar and baking soda, or perhaps some citrus peels should bring the freshness back. We need to get the machine running again for the cleaning process to be most efficient. There are different causes that prevent it from starting. Most of them are simple matters that can be managed with standard tools and in little time. Basically, what you have to do is clean out possible obstacles that lodge the grind chamber. It can be a coin, a rubber band or something of the sorts. Next, most disposer units have an unjam mechanism to be exploited. Read their manuals and do as instructed. The process is pretty straightforward. 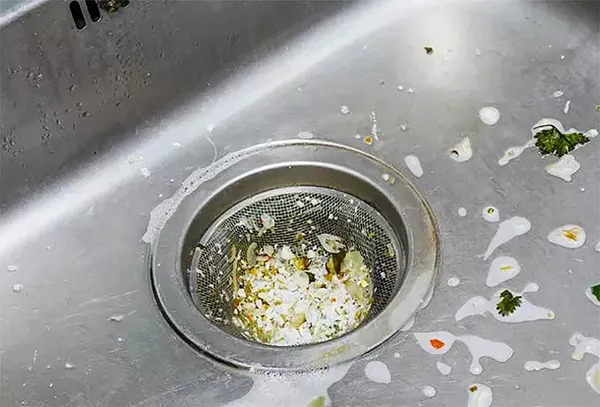 You can also take a look at our article on fixing garbage disposals if you fancy. Now that the machine can operate, time for some cleansing. Put stopper in place. Mix 1/4 cup baking soda with warm water (about half the sink). Turn disposer on and remove stopper from sink at the same time to wash away loose particles. ½ cup of baking soda and ½ cup of vinegar down the drain. Wait for at least 30 seconds then turn machine on and pour down hot water. Wait for another 5 minute then run cold water. To my experience and knowledge on the matter, that should flush away all of the debris. Now, the odor may still persist, albeit not as bad as before. There are a few ways to blow it away once and for all. – Commercial solutions. Something that foams up would be best, like the Glisten Disposer Care packets or the Affresh Disposal Cleaner. They often say “prevention is better than cure”. I think that is also true in these types of situations. You don’t even have to clean the machine everyday or something like that. Once or twice every two weeks is as frequent as it requires. Just don’t neglect the task entirely and only give it some care when there’s a smell. Here’s what I recommend for a garbage disposal cleaning routine. This is what I have found to be efficient. – (twice a week) grinding cubes of ice or frozen vinegar, perhaps with salt. – (once a week) cleaning with home-made solutions and citrus fruit peels. Following that will keep your unit nice and fresh for a long time. Another way to prevent from clogs and odors, besides cleaning, is maintenance. To these machines and the sink drain, there are certain things that should not be done in general. If you don’t know these things yet, now is the time to learn and put them to practice. …pour grease or fat down the drain. Put it in a jar and dispose later in bins. …use hot water when grinding. It’s OK to pour hot water mid session, however. …fill disposer with too big a load of vegetable and/or fruit peels all at once. …grind large amount of egg shells or fibrous material. …turn the machine off too soon when grinding. Let it run an extra 10-20 seconds with running cold water.